In early 2013 after two years of work, I finally completed the preparation, identification and curation of my extensive Upper Pliocene collection from the Eastern United States. My intent afterwards was to quickly use the same method to knock out my Pleistocene collection so I could start on a new large Cretaceous project. But as John Steinbeck once wrote “The best laid schemes of mice and men often go awry” applies here as I continued to add to my Pliocene collection throughout the remainder of 2013 and into 2014. 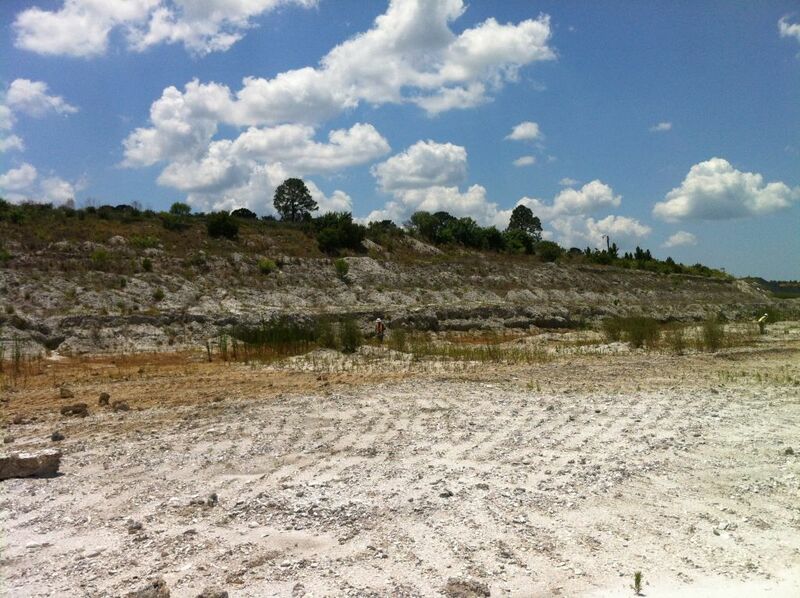 Field work in 2013 included three trips to the SMR Aggregates quarry near Sarasota exposing the shell rich Pinecrest Sand and in 2014, five different sites of the latest Piacenzian Chowan River Formation in North Carolina. I originally intended to include both into the same post with an updated Upper Pliocene species list however this quickly became unfeasible because of the numbers of new species that I collected from both formations. As a result, this entry will concentrate on SMR and the next on the Chowan River. 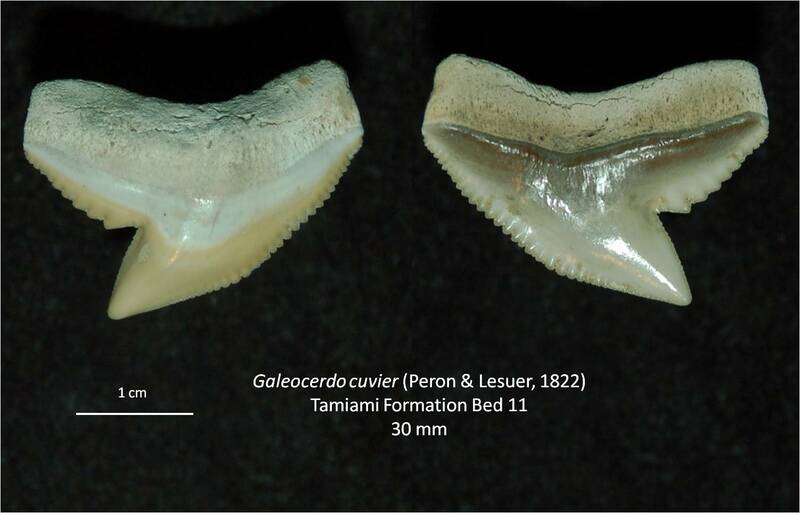 As previously described in earlier posts, the Pinecrest Sand Member of the Tamiami Formation is an Upper Pliocene, mollusk-rich deposit exposed mostly in South Florida quarries which mine the shell and sand for road fill and construction. The Pinecrest is the most biodiverse geological unit in the United States and was formed by winnowing; a process in which mollusk shells are buried and re-exposed by currents and storms to form highly concentrated shell beds. The beds themselves have been classified into 11 units based upon lithology and certain mollusk species which tend to dominate specific beds. 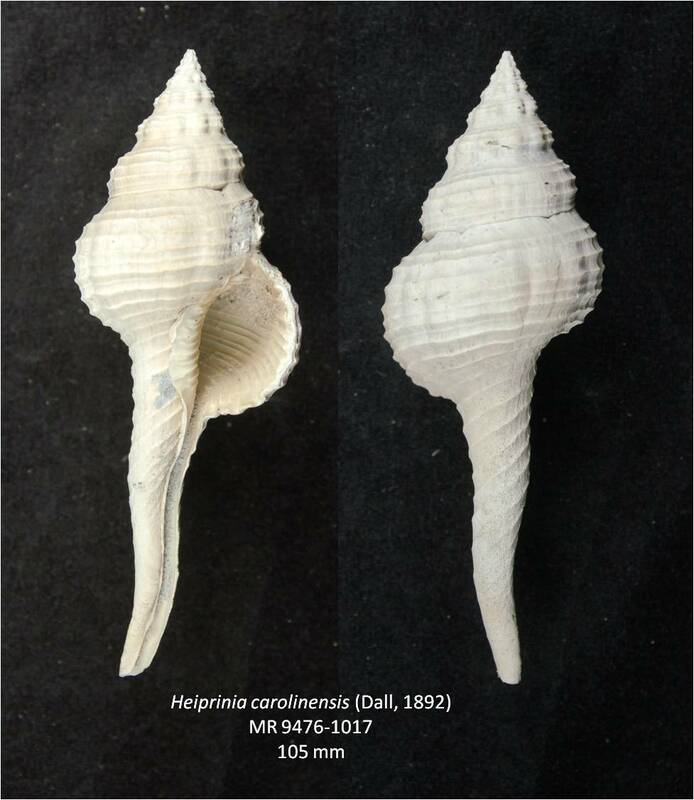 The mollusks are mostly a mix of tropical and subtropical species some of which are shared with contemporary deposits in the Florida Panhandle (Jackson Bluff Formation) and Mid-Atlantic region (Duplin and Zone 2 Yorktown Formations). 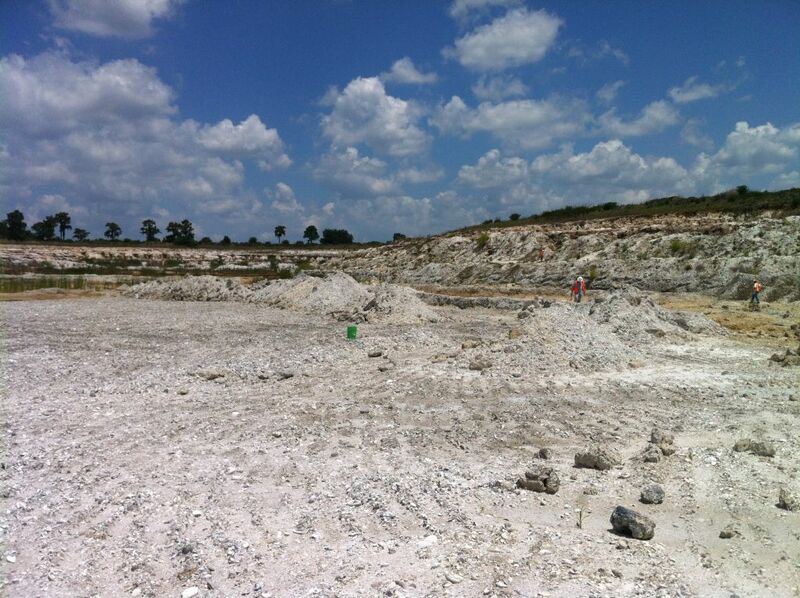 The SMR Aggregate quarries lie within Sarasota County just south of the Manatee County line. When I first began collecting the site in 2012, SMR was mining Bed 10 in the Phase 8 pit. Since then, all activity is westward in the Phase 10 pit, first mining into Bed 7 and then down to Bed 10 removing all shell and sand until Unit 11 is reached. In 2013 there was a flurry of field trips organized by various groups due to the impending closing, reclamation and development of the mine. As a result, I attended field trips organized at various time throughout that year by the Florida Paleontological Society, Conchologists of America, and the Southeast Geological Society. Figure 1. 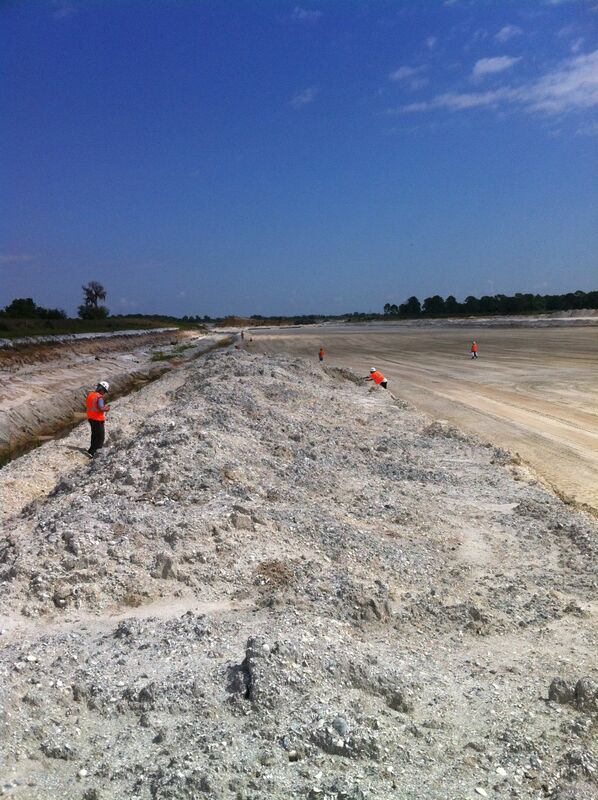 SMR Aggregates Phase 10 Pit, Sarasota County, Florida. Left two photos quarried down through Bed 7. Right two photos second bench quarried from Bed 8 to top of Bed 11. In my initial posts about the Pinecrest, I had made much about the opportunity compare differences in individual beds that Ed Petuch used for describing new species with only subtle differences. My four trips to the quarry however has convinced me that this is impossible to do as the initial mining is through Bed 7 resulting in a mixture of Beds 1 to 7 and then mining down to the top of Bed 11 which is a mixture of Beds 1 to 11. As a result, my labels which state Bed 7 were merely found on the upper quarry bench and Bed 10, the lower (fig. 1). Figure 2. Selection of specimens collected in the 2013 field season. As with any single locality repeated visitation has cut down on the amount of material that I bring home from SMR but has allowed me to become more selective of what I collect (fig. 2). My last trip to the quarry, I concentrated on vertebrates found within Bed 11 adding slightly to my Pinecrest fauna list. Reviewing my earlier posts concerning various Pinecrest horizons, I discovered that I had never produced an overall fauna list which is rectified below. 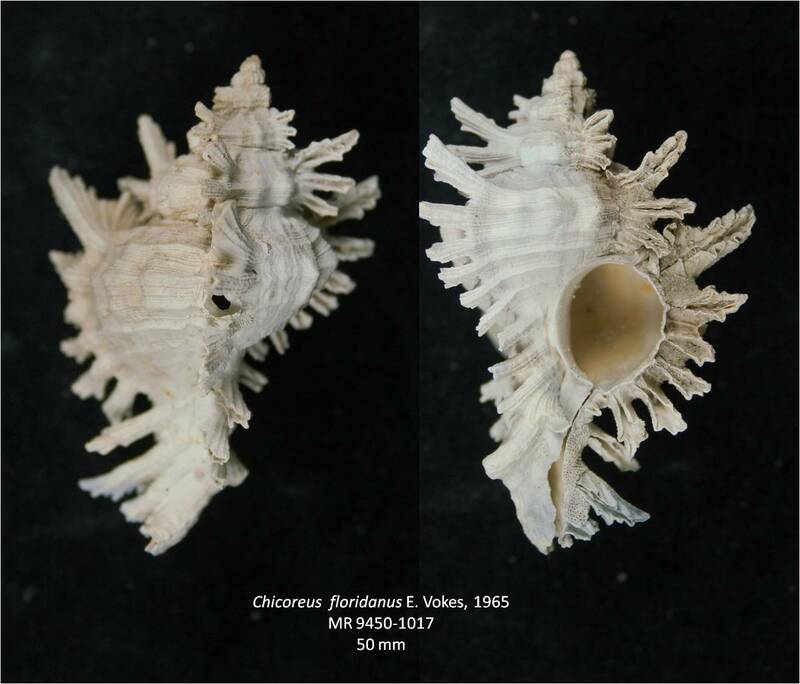 In comparing this list with my previous Pinecrest bivalve and gastropod lists or of Tamiami species in my Pliocene project, one will notice that there are differences not only with the number of additions but also with the removal of some species. This was due to refinement with my identifications and the acceptance of some of Ed Petuch’s species both of which I will go into more detail when I update my Pliocene Project. The list contains all species that I have found within the Tamiami Formation including the limestone facies (Ochopee) and a few from the Kissimmee fauna. With the exception of only a handful of species, mostly echinoids, the vast majority can be found at SMR. The list is dominated by mollusks; 185 bivalves, 317 gastropods and 2 scaphopods and is probably less than 50 percent of what is estimated that can be collected in the Pinecrest. In the past, I have posted references but instead of duplicating past efforts, I have only included those that I have not previously listed. 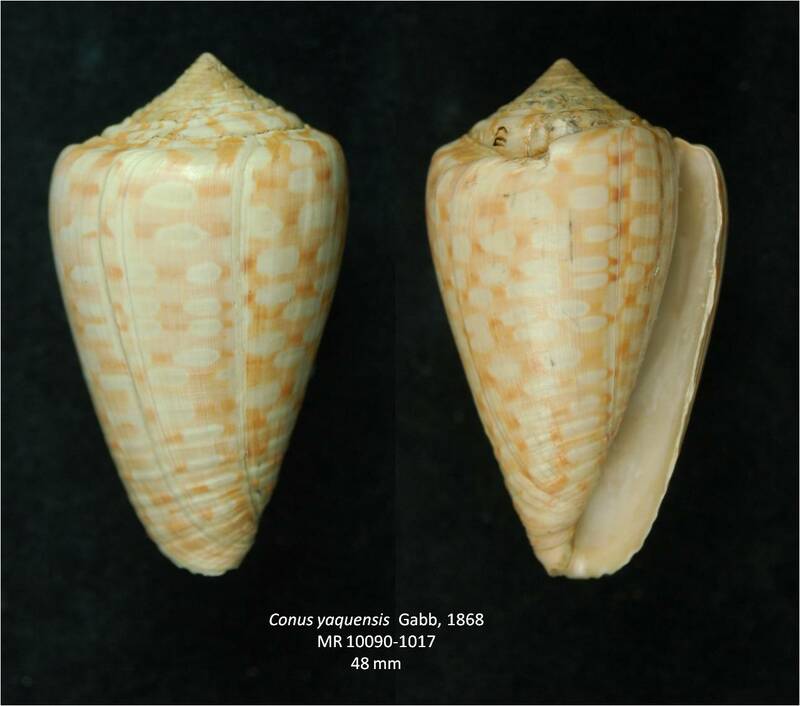 Allmon, W.D., 1993, Age, environment and mode of deposition of the densely fossiliferous Pinecrest Sand (Pliocene of Florida): implications for the role of biological productivity in shell bed formation. Palaios, 8:183-201. Ketcher, K., and W.D.Allmon, 1993, Environment and mode of deposition of a Pliocene coral bed: coral thickets and storms in the fossil record. Palaios, 8:3-17. Portell, Roger W., Guy H. Means, Richard C. Hulbert Jr. 2012. 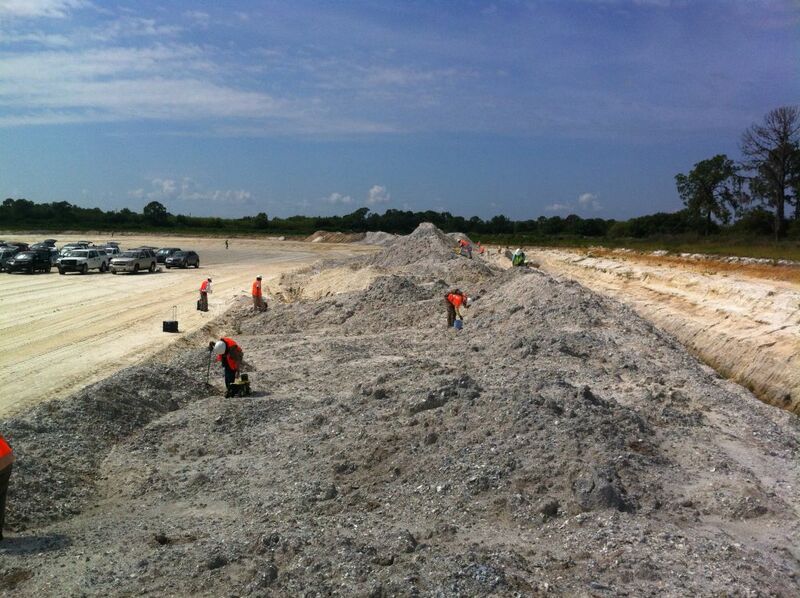 SMR Aggregates, Inc., Sarasota, Florida. Southeastern Geological Society Field Trip Guidebook, Vol. 56, 24pp. Stanley, Steven M. and William F. Ruddiman. 1995. Neogene Ice Age in the North Atlantic Region: Climatic Changes, Biotic Effects, and Forcing Factors in Effects of Past Global Change on Life, Studies in Geophysics. National Academy Press, Washington., D.C. pp 118-131. Well done, Mike. The extension of your Pliocene project will be an excellent reference. Excellent report, Mike. Your faunal list will be very useful. I think I'll be lucky if I can match 1/4 of the species you've got there. I'm pretty sure I remember you picking up that Conus yaquensis, or another with similarly outstanding color markings. Are there any upcoming trips to SMR that you know about? Thanks Chris. Marine vertebrates are present at the bottom of the pit and the last time I was there, I managed to walk away with shark teeth, a whale ear bone and a couple of whale vertebrae, however verts are not as common as Cretaceous lag zones that I have worked in NC or even the Phase 8 pit. Since Phase 10 mining is heading back towards Phase 8 maybe vertebrates will become more common. The nature of the mining at SMR where everything is mined into spoil piles down through Bed 7 is not condusive to Bed 4 vertebrates however I saw an excellent alligator vert that someone else found at the upper bench. There is a lot of predator/prey interaction with mollusks going on. Last year I went on a live hunt for recent mollusks where I picked up a large left handed Busycon feeding on a King crown conch which was feeding on an oyster. Not only are mollusks being fed upon by drilling Naticids and Muricids, but also crabs which break the aperature lip to get to the animal. The C. yaquensis shows an unsucessful attempt by a crab which healed. 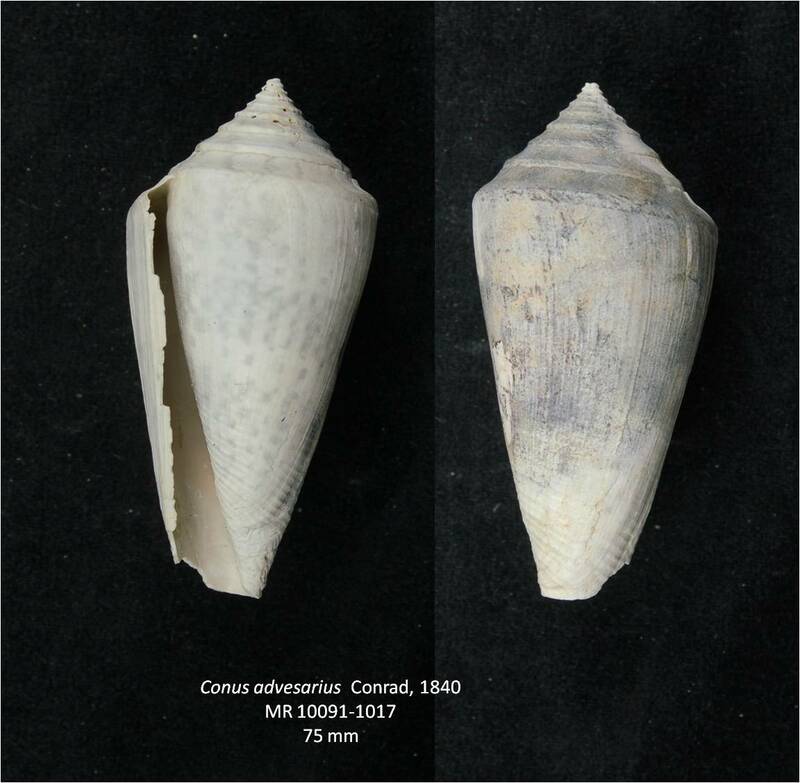 I have a large number of Turbinella shells all which show healed crab predation. Roger Portell is working with a graduate student who is looking at drilling predation on scaphapods and I donated a large number of specimens not only from SMR but other eastern deposits and California. According to Roger, not all are from gastropods but some from drilling octopus. You are right. That is the cone that you saw on that last trip. The number of species on my list is from multiple trips to SMR as well as a similar number to the old APAC pit in the late 80s early 90s. The mining at APAC was somewhat different. They did not do bench quarrying like SMR but had a gradual incline down to the lower levels. This allowed picking from each bed. I believe that APAC was more diverse because of that as well as being west of I-75, more marine. I haven't heard of any additional trips yet to SMR but if I do hear something, I'll let you know. Thanks Mike! Hope to get into a pit directly someday. I havent seen any scaphopods in the other material I've looked at yet but maybe I should pay more attention. An Octopus predation example would be really neat to find!